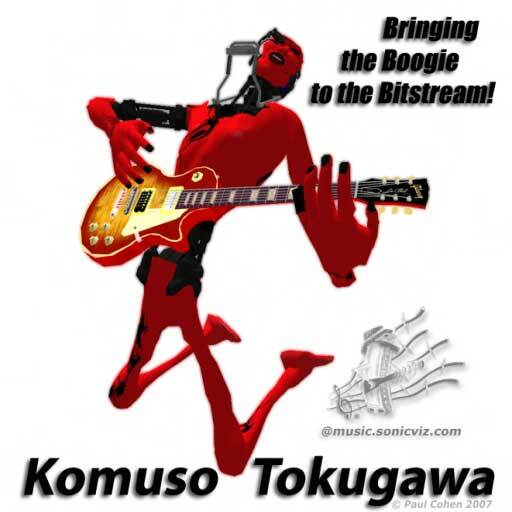 Komuso is my online musician virtual alter ego (or Avatar), born in SecondLife in 2005 where I was one of the first musicians to start performing live music streaming to virtual audiences. If I had to describe my style in a short sentence I’d say it’s all about Groove, Tone, and Story. I’ve always loved blues music, but I’m also deeply invested in other world/roots music traditions that reflect the human condition. My world music tastes span Reggae, Gypsy, Fado, Soukos, West African griot styles, Middle Eastern, indie alt rock to ambient trance electronica. I’ve even “invented” some new hybrid genres such as as Bluestronica, Grunge Blues, and Reggae Blues to describe some of these musical experiments. You can also virtually see/hear them in projects such as my Spatial Music Visualizer. I sing and play slide guitar mainly (with a dose of finger style and pick), Harmonica (mainly in a rack), Shakuhachi, and electronics of different types via different control interfaces. My main guitar is a currently a Steinberger Synapse Transcale ST-2FPA (my backup is a Hohner G3T headless since ~1991), and I play mainly Suzuki Manji & Lee Oskar Harps. I’ve busked in Europe, UK, Alice Springs and played in a few bands from Oslo to Tokyo. My favorite memories are when I spent nearly a year busking on Las Ramblas in Barcelona in ’91. The ever changing Bottleneck Blues band in Tokyo was a lot of fun too. I’m deeply interested in music technology and new music genres across all boundaries. I’m also a producer/developer of educational apps such as Fopra and the benchmark Harmonica training app HarpNinja. As a Creative Technologist I also work with many different technologies across many different areas. Generative music systems are an interesting area that I’ve done a lot of research and experimentation in as well. I’ve spent a few years virtually busking in virtual worlds like SecondLife playing solo (with and without my robot backing band) and also real time music jamming with multiple musicians located in different countries. When you registered for SecondLife they gave you a list of last names to choose from, but you could choose your own first name. At the time I was learning Shakuhachi, a traditional end blown Japanese Bamboo flute played by Zen monks known as Komuso, so I chose Komuso as my first name as it resonated with a few things I was working on. The Komuso had an interesting history during the period of the Tokugawa Shogunate so Tokugawa seemed like a good choice as a last name. 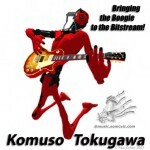 I designed a custom avatar to represent Komuso in the virtual world, kind of a voodoo shaman cyborg hybrid I call “Komuso the BluesBorg”.